(Phys.org) —A California-based company has a new kind of wheel for skateboards that delivers a novel shape and claims a special ride experience. This is the Shark Wheel, not circular, not square, but something more interesting. The wheels appear as square when in motion from a side view but the wheel geometry is more than that. The wheels feel circular to the rider, and viewing them along with more details may help to clear the mystique. The wheels are made of three strips each; these create a helical shape when they roll, and they form a sine wave pattern. When the wheels make contact with the ground, good things happen, say the team behind the wheels—the user gets speed, better grip, and a smoother ride. As the wheel inventor, David Patrick tells the story, the wheel began when fashioning a cube made of different parts, and he accidentally dropped the object on to the ground, That is when he got his inspiration to reinvent the wheel. He had figured out how to take six simple shapes and assemble them in such a way to form a cube. When by accident he dropped the cube to the ground it rolled and it kept on going and going no matter what the terrain. He and the team got to work modeling the design, testing the wheel performance in different conditions and with focus groups of experienced riders, and molding a final design in industry-standard urethane. They now want to do a full production run, and for that phase they have launched a Kickstarter campaign. They have surpassed their goal of $10,000, having raised $21,823 at the time of this writing. Estimated delivery of the 70mm skateboard longboard wheel is September 2013. For $55 and up you get four of these wheels and more depending on the size of the pledge. 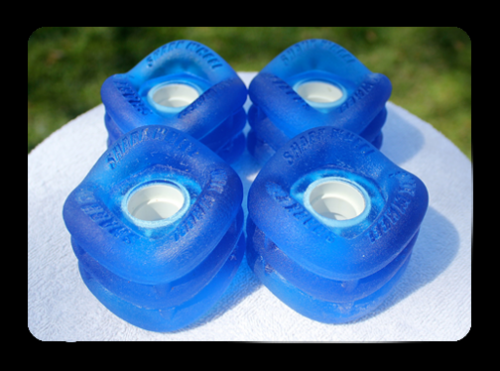 Based on the success and speed of response, it appears that the stated benefits of the Shark Wheel are appealing enough to those who skateboard. For example, less friction points on the ground allow the wheel to roll faster than a traditional skateboard wheel. The sine wave pattern is said to support better lateral grip. The team says the wheels perform well in rain and gravel. The alternating pattern of grooves reduces hydroplaning by channeling liquid, sand or gravel out and away from the surface of the wheel. Rounded edges allow liquid and gravel to pass around the wheel. Another advantage is its self-centering design, where at high speeds the Shark Wheel does not suffer from "Speed Wobble." Skateboarders are not the only end users that Patrick and his team have in mind. Their first products for sale are for the skateboard industry but they would like to see a day when their wheels enter other markets as well. Don't tires often have such kind of sinusoidal pattern as well?